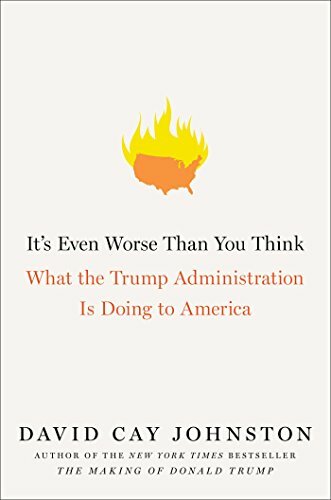 Kleptocracy Rising is one of the chapters in David Cay Johnston’s second book on Trump, but this time he reviews specific actions of the Trump Administration against the republic. He manages to keep the material fresh, revealing a more nuanced perspective on the shenanigans of the Trump White House. Though he hasn’t aimed for shock and awe, it is difficult to avoid feeling concussed when his pages examine the extent to which Trump and his cronies are using the presidency to enrich themselves at taxpayer expense. From their use of chartered flights for Trump’s entire family, requiring secret service protection at many locations, to mandating civil servants stay at his hotels and resorts at taxpayer expense, to photo ops in front of his property, it is obvious to all that the Trump clan is bilking the government. The White House is truly for sale under the Trump Administration as evidenced by the changes in foreign policy for nations which offer financial enrichment to Trump or any of his relatives, associates, or minions. Outright lies by Trump and the enforcement of same by his lawyers, which are paid for by the government for the many lawsuits which have been enacted while he is president. Johnston illustrates Trump’s disregard for the provisions of his blind trust which was established to avoid conflict of interest while he is in office. Currently there are 16 states, an ethics watchdog organization called Citizens for Responsibility and Ethics in Washington, and many private businesses that have lawsuits against the president just for the Emoluments clause. Former Bush ethics chief uses the term apoplectic at Trump’s conduct and the failure of Republicans to speak up. The State of New York has an active lawsuit against him, and the there is no prohibition against any state pursuing action against the president. Trump’s predatory behaviors have not ceased since he entered the presidential office, where he has refused to pay contractors, lied about his worth on his ethics disclosure, used Mafia style negotiation tactics to reduce payments to local governments, and refused to return deposits to members who resigned from the Jupiter Golf Club when it was purchased by the Trump organization. Alarmingly, the Trump Administration is selling publicly owned utilities at a discount to private energy companies, to enrich the pockets of shareholders while raising electric rates for the masses. This technique was used in Massachusetts when a large electrical plant was shuttered to afford a rate increase to the Northeastern region. Current plans are to sell off the Bonneville Dam, in Washington State, which supplies much of the electricity for the entire west coast, at very reasonable rates. If you aren’t yet petrified of what the Trump Administration is doing regulatorily, it has stopped enforcing and publishing the names of peoples killed in the workplace at the Department of Labor site. The EPA has stopped posting scientific data on climate change, the department of Health and Human Services is not allowed to talk about reproduction, birth control, or evidence-based terminology. And the Trump Administration has stopped enforcing fines across government agencies, which help fund the government, like the Consumer Financial Protection Bureau which has recovered 12 billion dollars from predatory lenders, nearly four times the cost of running the agency. Sickeningly, Johnston states that while Trump promotes his concern for veterans, his new budget penalizes disabled veterans and does not offer meaningful budget increases to meet the needs of combat veterans. And for those of you lacking a million bucks to launch your first endeavor and fully paid university education, Trump will have students pay higher interest rates to private lenders, while curbing government loan programs for low-income college aspirants. David Cay Johnston is truly Prometheus bound in this sickening reveal of the Trump Administration. The bottom 98% cannot afford to ignore his clarion calls to the masses at the destruction of democracy.